Great savings on selected holidays departing between 1st April and 31st October 2020. Fantastic deals on Package Holidays, City Breaks, Cruises to top destinations including Florida, Cuba, Las Vegas, New York and many more plus save on your next holiday with a last minute deal to your favourite destination! Where do I use my Thomas Cook voucher code? Click ‘Get Code’ to reveal and copy the Thomas Cook discount code. The discount will be automatically applied to your holiday booking, continue with the payment process and enjoy your holiday! "If you can’t book early, book last minute: Booking your holiday as late as you can might not leave you with the best choice of holidays, but you should still be able to find a cheap deal - and save even more with one of our vouchers." With holidays to cater to any taste - active holidays, beach vacations, city breaks, package deals, self-catering accommodation, snow and ski adventures, luxury all-inclusive holidays and more - Thomas Cook’s selection of flights, hotels and cruises can also be viewed in order of price per adult, as well as by most popular destinations, to help you find bargains in the best places around. Shopping on their online site, prospective holidaymakers can enjoy the ease of holiday shopping from the comfort of their own home, along with arranging handy extras like insurance, currency exchange, car hire and airport parking available in one convenient place. Thomas Cook Holidays are the perfect way to enjoy a great quality holiday without breaking the bank. There are often many ways to save, with online booking discounts, early booking discounts and flash sales available on many holidays. Whether you want a family beach holiday or a romantic city break there are plenty of holidays on offer in destinations worldwide including popular locations like Gran Canaria, Spain, Tunisia, Croatia, Bulgaria, Greece, and Turkey. Thomas Cook provides you with plenty of choices when it comes to holiday types. Not only do they provide good quality escapes in your standard beach destinations they also offer golf holidays, winter escapes, luxury holidays, exclusively adult holidays, family-based holidays and exotic getaways to faraway shores. With all this choice and more you are bound to find the perfect, affordable holiday with Thomas Cook. Book a spontaneous holiday with Thomas Cook’s Last Minute deals. Simply use the Late Deal Finder to save money on your online holiday booking. Book within 6 weeks of flying and take advantage of the big discounts available on holidays of every kind, with city breaks, summer holidays, all Inclusive holidays and more all being included in the last minute section. If you’ve had enough of mundane life and gloomy weather get away from it all with your family or even just you and your loved one. You could be heading out to Paris for a romantic last minute weekend away in no time, or perhaps you’d prefer to relax on a lounger by the sea, somewhere that’s blissfully warm like Dubai or the Canary Islands. Whatever your ideal holiday is, you’re sure to find something perfect in the late deal finder with Thomas Cook Late Deals. All-Inclusive Holidays are a great holiday option for those on a budget, with all meals and drinks pre-paid for before you fly. Most inclusive hotels will often include both daytime and evening entertainment too, there’s no need to leave your hotel or even bring spending money. There is often the choice to upgrade from half board to all inclusive once you reach your hotel, however by doing so before means that you’ll receive a discount on the cost, making your holiday more affordable and hassle-free. If you’re not fully decided on where you’d like to holiday, your only main requirement being that there must be sun, sea, and sand then take advantage of the savings available in the All Inclusive deal finder and jet off on a Thomas Cook All inclusive break that’ll never forget. For some, the concept of laying on the same beach all holiday is a boring idea. Some prefer to wake up every morning to a new destination while relaxing on-deck with a glass of champagne after an enriching day of sightseeing on a Thomas Cook cruise. As a leading cruise specialist Thomas Cook pride themselves on their unrivalled selection of Cruises. From a huge choice of cruise lines and ships to a host of popular destinations spanning the world – the variety is endless. And, the impeccable service from the minute you book to the moment you arrive home makes Thomas Cook cruises unbeatable. With a wide range of competitively-priced cruises, you’ll be sure to visit the places you most desire at a time and date which suits you. If you prefer to choose your flights separately to your hotel then Thomas Cook Flights offer you the perfect freedom to do just so. Your flight is one the most important elements of your holiday, from the moment you step on the plane your holiday begins, and who better to begin this journey with other than Thomas Cook. Their brand new refurbished and refreshed fleet flies to over 60 destinations worldwide. Once you have settled on your destination, you can choose the exact day and the airport you want to fly from. Just choose your seat, pick your desired baggage allowance, choose your perfect James Martin In-flight meal and even shop for some duty-free. Whether you are looking for a budget hotel or a beachfront hotel, a city centre hotel or a luxury spa hotel, Thomas Cook will have the hotel for you. Thomas Cook hotels boast an impressive selection of accommodation with hotels available across the globe. With 971,643 properties worldwide in 92,977 destinations in 224 countries and territories with Thomas Cook, you’re spoilt for choice. And, with 97,480,000 verified reviews, no booking fees, and the best price guaranteed you can be confident that your holiday will be an affordable and assured success from start to finish. What is the baggage allowance on Thomas Cook flights? Thomas Cook provide customers with a complementary hand baggage allowance of 6kgs on all of their flights. This allowance must conform to the hand baggage guidelines and dimension sizes, all of which can be found here. https://www.thomascook.com/baggage/hand-baggage/ On this page you’ll also find information on the baggage allowance for premium customers as well as the allowances for infants and wedding baggage. If you’re heading off on a long haul holiday and require a large suitcase for your trip you’ll be pleased to know that Thomas Cook Airlines also offer between 15 kgs and 23 kgs of baggage allowance for each traveller. Click here for more information on how much baggage allowance you’ll receive with your specific flight. If I'm travelling with children will we be seated together if I don't pre-book seats? To ensure that you are all sat together it is advisable to pre book your seats before you fly. If this has not been done, airlines will do their best to seat you all together, however this could mean a family is split over an aisle or rows in front or behind. If when you check in online it has not been possible to seat an adult with a child, please visit the check in deak at the airport when you arrive. Do you offer free child places? Thomas Cook offer 'Kids for £1'. This means that there are several places where you will only pay £1 for a child's stay at selected hotels. These are offered on a first come first served basis, so it is always best to book early in order to take advantage of the offer. What is the choose your favourite sunbed feature? At selected hotels and resorts you have the option to resrve you sunbeds before you even fly. If this feature is available at your hotel you will receive an email 6 days before flying giving you the option to reserve your bed. This will be £25 per sunbed, regardless of the holiday duration and the reserved sunbed(s) will be yours for your whole holiday. You can change your option once you are at the resort if there is the availability, however you can not book this once you are there, it must be done before you fly. Thomas Cook offers a wide range of holidays, flights, cruises and many holiday extras like travel insurance. 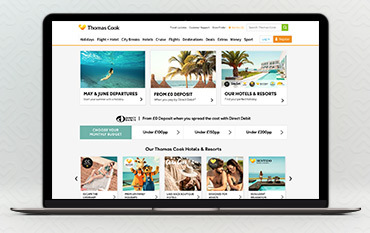 Save money when booking your next holiday by using one of our Thomas cook Discount Codes to get great deals on all inclusive, self-catering and half board holidays. If you are looking for some inspiration check out Thomas Cooks great travel guides to places such as Amsterdam, Bruges, Barcelona, Venice, Las Vegas. Grab a long haul bargain to destinations including Maldives, Bali, Thailand, Kenya, and Australia, combine this with a Voucher Codes and your well earned holiday will cost you even less. We are constantly on the hunt for Discount Codes for Thomas Cook to help you with your money saving. Our experts check dozens of sites for secret codes including NHS discounts, student sites & social media channels saving you time & money!